Canada has a permit problem -- and it’s hurting the economy. The way National Bank of Canada head Louis Vachon sees it, the economy is splitting into two extremes: There’s the “permit economy,” where resource and manufacturing companies face delays and roadblocks for project approvals. Then there’s the service and technology economy, mostly based in big cities, which is booming. “The exports numbers generated by the ‘permit economy’ is below potential,” Vachon, who heads Canada’s sixth-biggest bank, said Friday in an interview. “Private investment in those sectors is below potential and it’s partly because of the difficulty in getting permits or the permits in time. In that segment of the economy I think we have issues of efficiency." Vachon sees the service industry doing “extremely well" across Canada. 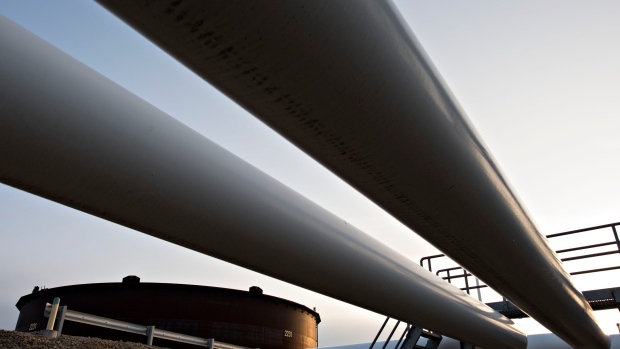 It’s a contrast from the traditional mainstays of the Canada economy, as companies like Kinder Morgan Canada Ltd. face protests over a $5.9 billion pipeline expansion to the Pacific coast. “If you want to build something -- a plant or anything that you need a permit -- it’s a little bit more difficult," he said. “It doesn’t mean it doesn’t get done: just drive around Montreal; there’s a lot of infrastructure that’s getting done." He argues that both sectors are related and necessary for a healthy economy, and uses a familiar analogy to illustrate his point. “You cannot have new apps without iPhones and without lithium and without graphite and without energy to operate," Vachon said. “So over the very long term the permit and the non-permit economy are related."